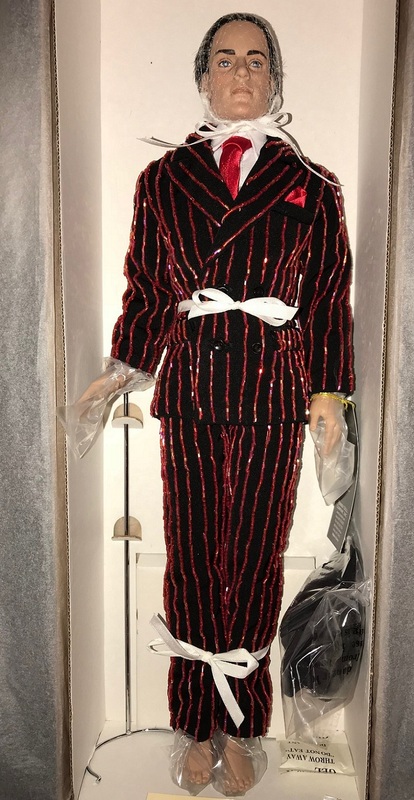 "Razzle Dazzle" (Richard Gere's Billy Flynn character from movie "Chicago") is wearing the flashy outfit straight out of the movie. His double breasted black gabardine suit (lined) is meticulously trimmed with hand-sewn red bead 'pinstripes.' It's worn with a crisp white cotton shirt (note the over-sized '20s collar)' red tie with matching pocket square; black socks and black shoes. Display waist grip display stand included. Never displayed.